Today I have a review of a nail polish for you, as you probably already know, I love nail polish and paint my nails on a weekly basis. I received the Nails Inc Gel Effect Polish in St James, a gorgeous red colour in a goody bag that I was kindly given at the Mid Summer Meet blogging event held by the lovely Hannah with Look Fantastic, All Sole and My Bag a couple of weeks ago, it was a brilliant event and great to get out for a couple of hours. I was really pleased to find the Nails Inc Gel Effect polish in my goody bag, and can I just say the goody bag was amazing, I will be filming a You Tube video soon where I will show everything I received, the video has been highly requested and I can't wait to show you all the other products I received. Anyway on to the nail polish. 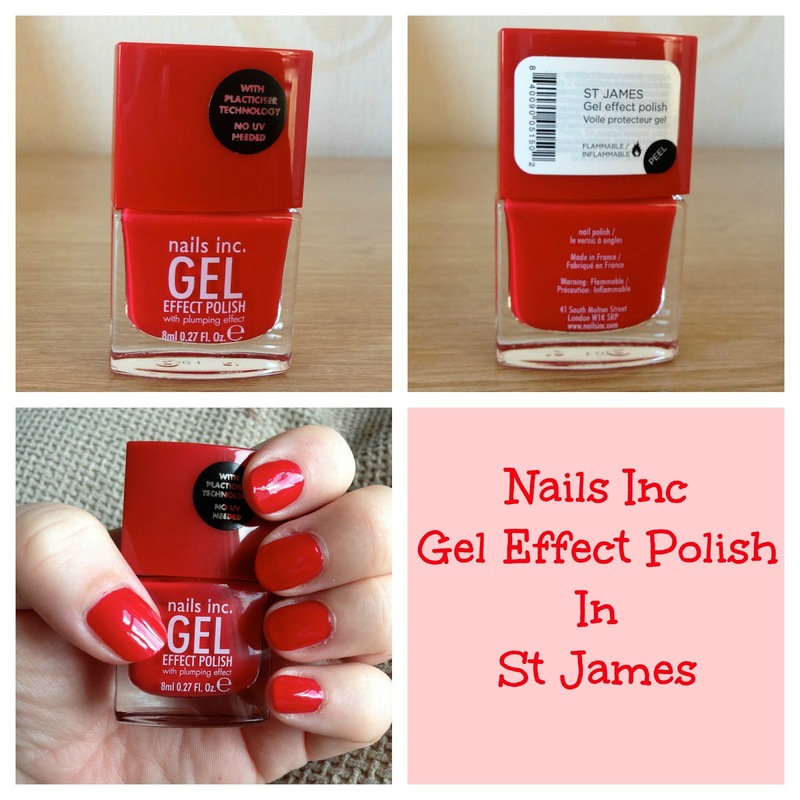 Nails Inc Gel Effect Polish in St James is a gorgeous red polish, Nails Inc claims the polish provides a high shine, super glossy finish without the need for a UV lamp or soak off. The gel effect polish contains the same plumping technology as a salon gel manicure to provide a flawless, high gloss manicure. The polish is formulated with plasticiser technology creating a "gloss finish like you've never experienced before with a standard nail polish". I loved the colour of the polish and was really excited to try it, the polish was really easy to apply, I used my Orly Bonder base coat as I always do with any polish and then applied 2 coats of the Nails Inc polish, I finished with a coat of my Orly Glosser top coat, as I always use both the base and top coats with all my polishes I felt to enable me to write a fair review I would apply the polish as I apply all my polishes, with a base and top coat. As you can see from the above photograph, the polish is very glossy, in the photograph I have not applied the top coat, I wanted to show you the finish without a top coat, it is very glossy and I was really pleased with the polish and how it looked. I took photographs of the polish over the next few days so you could see how it wore. I applied the polish on a Tuesday afternoon, day two is Thursday afternoon, my left hand was fine but my right hand had a couple of small chips but they weren't really noticeable. By day 4, Saturday afternoon my nails were quite badly chipped and normally I would have removed any other polish if it had chipped in the same way. 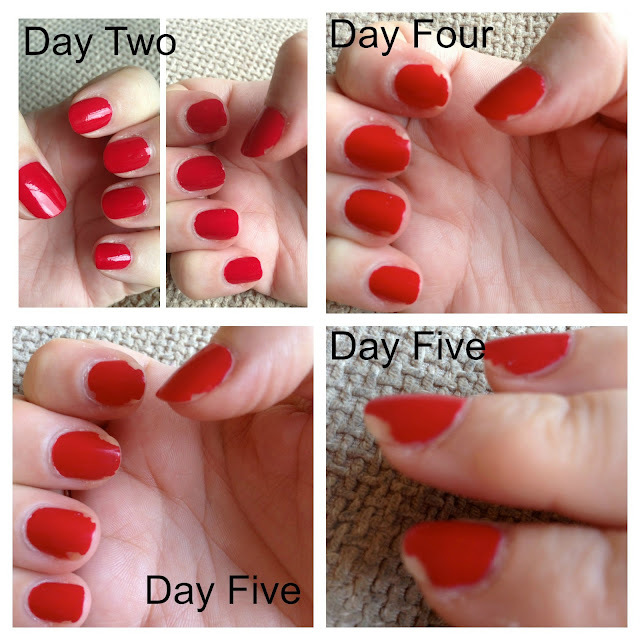 By day 5 you can see my nails were badly chipped and the polish needed to be removed. I was a little disappointed in the polish as after only 48 hours my nails did have small chips on them, if I had paid the £14 price tag for this polish I would be very upset indeed. Usually if I paint my nails with an Essie polish or an Orly polish and use my usual base and top coat, my nail polish lasts 7 days without chipping. I had high hopes for this polish but sadly it didn't live up to my expectations, yes it is very glossy and it's a beautiful colour and easy to apply but for £14 I would both expect and want a polish to last longer than 48 hours before chipping, if the polish had lasted 5 days and then chipped I would have been happier. I won't be re purchasing the Nails Inc Gel effect polishes but if you'd like to try them they are available in 4 shades here and retail at £14.